For only $30, you can attend an event. When you arrive at the event venue for check in, you will be given a name tag and a date score card. If you arrive early, feel free to mingle with the other dates, relax at the bar, or just wait for the event to start. 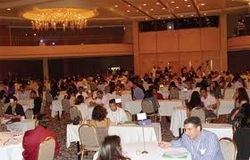 After the check-in period is over, the speed dating will begin. You will be seated at an assigned table and after some final instructions by your host, your first date will begin. Each date will last four minutes, giving you enough time to determine if you would be interested in pursuing a second date. When the four minutes are over, you will hear our end-of-date notification (we'll explain this at the beginning so you will know what to listen for). You will then have about 30 seconds to mark either a 'yes' or a 'no' on your score card. The men will move to the next table for the next date while the women remain seated. This process will be repeated until all couples have dated everyone. At the end of the event, simply turn in your score card to the host who will tabulate all the 'yes' matches. The next day you will be sent an e-mail informing you of all the dates that you matched up with (both marked 'yes'). The e-mail will include each of your matches and their e-mail address. Good luck and remember all it takes is 1 connection! *NOTE* IndySpeedDate reserves the right to postpone/reschedule an event based on the number of registrations. Each participant will be notified via email a minimum of 12 hours prior to scheduled event time.